Music as a healing force. 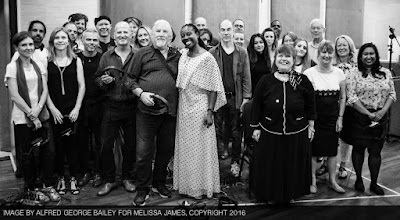 LondonJazz News: What inspired you to release ‘Live Again’ and to raise money for SANE? Melissa James: The SING4SANE (S4S) project was inspired by the first recording of my song, Live Again. I wrote the song about two years ago after I watched someone struggling through a mentally challenging time. It was during this period that I began to really become aware of how difficult it can be, when you’re unstable mentally, to get professional help. Of course part of the difficulty can come from trying to convince the person who you can see needs help, that there is a problem. I made several calls to health professionals on this person’s behalf but quickly learned that really, unless you are hugely at risk of harming yourself or another, it can be difficult for those suffering –and for those supporting those suffering – to get help. My own investigations led me to speak to others in a situation similar to mine who would report familiar, but sometimes more devastating stories, of people who never got the right help at the right time and who sadly had taken their lives. It was later when I made a recording of Live Again for a record yet to be released entitled Stripped Back that my journey towards creating the S4S project, began. I recorded Live Again acoustically, just with my voice and piano and hearing it in this way highlighted to me how much of the song’s message reflected my own feelings, even though I never imagined at the time of writing that I was writing about myself. I found I couldn’t speak-up and be open with others – even those close to me – about what I was feeling. If I’d broken my leg or arm or had a back problem or other health condition, I’d likely have had less of an issue talking about it to people I knew. But telling close friends and family about how I was feeling mentally was something I couldn’t bring myself to do. In October 2015 I held a launch party for the release of Stripped Back (but later decided to delay the release) and at the launch I invited some amateur singers to sing backing vocals on Live Again with me. This was really the turning point and, while I didn’t know it, it was SING4SANE in its early formulation because after the launch I quite quickly started to think about organising a public Big Sing in aid of mental health awareness. I’m not quite sure how and why this was but something “clicked” for me that night and it made sense that I would use this song – joined by others – to highlight mental health as an issue. SANE became the charity for which I would fundraise at that first big sing event which took place at Caffe Nero, Heathrow in February this year. LJN: How close is the charity’s work to your heart? MJ: What I like about SANE is that they are a small charity but, even with a small team, they are doing a lot of good work researching mental health illnesses and providing a free daily telephone helpline to anyone who might wish to use it. Helplines like theirs are invaluable. When I was in anguish over the situation of the person whose mental health difficulties prompted me to write Live Again, I turned to a helpline to speak about what they were going through and to get advice on how I could cope. It felt such a release to speak to someone anonymously who completely understood the situation from all angles and without judgement. LJN: Why did you decide to do a 'big sing', and what did it involve in putting it together? MJ: Music is “my thing” if you like so naturally I guess anything I do that involves trying to promote a cause is going to involve music in some way. I see the power that music can have all the time whenever I perform concerts and people recount to me certain lyrics of my songs that they have been touched by and why. Since starting this project – and particularly when I held the first Big Sing event – I realised that a lot of people had a mental health related story and had an understanding of mind ill health and how it can affect a person’s life. We’re all affected by mind health because we all have minds. A Big Sing is not a new idea but by bringing people together to sing, what I was hoping to encourage was that sense of ‘we’re all in this together’ and ‘we’re all affected’ and ‘actually’ it’s OK; in particular ‘it’s OK to say that we’re not OK.’ I didn’t need to know the story of anyone who was coming to join the S4S Big Sing but there was the underlying understanding I guess as to what the purpose of the event was and we all “got it”. Putting the event together mostly involved finding a space. Caffe Nero has always supported me musically; some of my songs are played in their stores so they were a good place to start in terms of finding a venue that could host the S4S Big Sing, particularly since the stores sometimes hold live performances. When I talked to them about it, they were immediately into the idea. The Heathrow space was an obvious choice because it has a piano in place. Other than that, I just put the word out online and told people when and where it was happening, inviting anyone who wanted to do so to come and sing with me. Then I had a bit of a panic that no one would show-up to sing with me on the day. I ended-up with 30 people alongside me at that event in Heathrow. LJN: Is music a healing force? If so why and how do you see it? MJ: You know, I’ve always thought that it is and you often hear people say that it is but there was something crucial that happened to me in making me really realise and understand this – and also in helping me to have a clearer understanding of my own purpose and why I do what I do. I was performing a concert last year and, towards the middle of the set, a man walked into the room where I was performing, stood at the back and I could see, from where I was, that he seemed really overjoyed to be there. He called out for a particular song of mine but I’d coincidentally performed it a couple of songs before so, not knowing why he was there, I wasn’t going to perform it again. At the end of the night I talked to him and he told me he was late because his flight had been delayed. He had travelled direct from his home in LA to be at the concert that night. He wanted to come to say thank you for saving his life after his assistant – who hadn’t known he was feeling suicidal at the time – sent him a couple songs of mine which reached out and touched him at exactly the right time. I was blown away by that story when he told me and I still am to this day. That’s when I truly recognised the power that music can have and the importance of what I do in making music. What I do is not about me it’s about me sharing something that connects with others. And that’s what I like to do: reach out, communicate and make connections. LJN: How are people's mental (mind) health, do you think, improved by music? MJ: Well, I know that generally for myself, I can feel a sense of healing by listening to a particular song or piece of music. I can feel empowered, happy or uplifted; I can process a difficult emotion. Music – even without words – can of course say things which otherwise can be difficult to say. Sometimes it’s indescribable how music can help, and that’s what makes it powerful. Email sing4sane@gmail.com to join the next planned S4S Big Sing which is scheduled for the New Year. All sale proceeds from the S4S single of Live Again go direct to SANE. The single is available for download via iTunes, GooglePlay, Amazon and other online music stores. LJN: How can music help reduce or even eradicate the unfair stigma that mental health is perceived to collect? MJ: It’s that silent knowing and understanding, I think. When I perform a song like Live Again, those who connect with it do so because they sense that I have an understanding of something they are feeling or experiencing. I’m not banging anybody over the head with a message when I sing any of my songs but the story of the song is there and, if it taps you on the shoulder and encourages the listener to take notice and to feel something, that’s a good thing. Because of Live Again, and some of my other songs, people have come to me – people I don’t know – and they have shared their stories. They might not have told their stories to anyone else but they did with me because they felt that I might understand because of the songs that I sing. A stigma will slowly disappear when more people speak, and are open, about the issue that is stigmatised. Bringing a subject out into the open helps people to discuss it without fear or embarrassment. It’s also about changing the face of mental health and perceptions of the word ‘mental’. When someone first suggested to me that I was suffering from depression, I didn’t recognise it because I didn’t think someone who was depressed could ‘look’ like me, or ‘be’ like me. It took me two years before I finally could see and accept that actually I had been suffering from depression probably since childhood. I just always wore a smile through it. LJN: Which element of music making do you most enjoy choosing out of live performance for instance or the studio work, songwriting, practice, research, creating an image, rehearsal and why? MJ: I definitely enjoy performing live most of all because music for me is about communicating and connecting with others. You can do that through a record of course but I love feeling that energy of people who are in a room with me. Together we’re creating, or having, an experience. I like being in touch with people generally so any opportunity to do that – and particularly through music – is what stimulates me. LJN: What’s the shape of the song ‘Live Again,’ both in terms of the music and lyrics, as you see it, in terms of listening notes or touching on little technical pointers to whet potential listeners’ and purchasers’ appetite and further pique their interest especially if some of them are musicians or singers themselves? MJ: The song gives a glimpse into the mind of a person in despair; a person who, maybe if you see them in day-to-day life seems to be holding things together. They appear confident and assertive but in quieter moments on their own, their mind is wild with doubts and dark thoughts. Negative voices attack their being telling them they aren’t good enough and causing them to feel anxious and very depressed. They want to escape this way of thinking but they can’t see how to calm these angry and bitter voices. They want to own up and be honest to someone close to them about the circling thoughts in their head but they wouldn’t even know how to describe what they are and they’d be worried that they wouldn’t be taken seriously and would be told they have to simply pull themselves together. The crux of the song comes in the bridge: “And I want to turn my world around / But I need my feet firm on the ground / ’Cause I think I am ready to start to change / Yes I am / But first I need some help to find my way” – that last line of the bridge is what the song is all about and at this point the song builds to its climatic line “All I want is to be free / From the battles of my mind / They keep my thoughts locked up inside.” This person is screaming: ‘I need help but how am I going to get it?’ It’s like saying: “I want to get out of this room but I can’t do it unless someone can show me how to get to the door”. The very final line of the song brings a hope that there is a way out of this feeling of desperation: “I want to start to live again” – because knowing that you want things to change is the first step in starting to make that change for the better. LJN: How did you first meet Ross Lorraine and how do you write songs together? MJ: Ross and I met via a site online. It took me a long time to decide I was going to push my fears out of the way and start writing songs but I knew I would have to do it with another. I put out an ad online to find someone to write with. Strangely, we lived about a 5 minute drive from each other and he’s still not far away from where I am now. Once we met and, having written the first couple of songs together, I soon began to feel like this was a partnership that could grow. Mostly I record thoughts and ideas (usually in the middle of the night or on waking in the morning) into a recorder and the lyrics and melody come hand-in-hand and often write themselves. The songs seem to ‘come to me’ in quite a strong form. We’ll meet and I might play him what I have or sing it to him along with other thoughts for how the song could take shape musically and he’ll build around it from there, or he might play with it a bit or sometimes we’ll sit together and work through it. It doesn’t usually take much time before we have a completed song, particularly now that we have a much stronger relationship and understanding of how the other works and thinks. LJN: Do you see "Stripped Back", your forthcoming album which is to be released in early 2017 I believe, as a departure in some regard or simply part of the process of going deeper as an artist? How's it all coming together following the recording session in the build up to release? MJ I’ve never really thought about it. And in a way, I’d rather not think about it. What I know and feel is that I’m learning, growing and evolving all the time. I’m certainly a different person, different songwriter, different singer I think from the one I was even earlier this year. My experiences have taught me lessons that have made me change, for the better I hope. As such, that’s going to affect my writing too and everything about me. But I don’t sit down to write a song trying to be “deep” or trying to do anything actually. I just write what I write with integrity. What I feel is what comes out, even, as was the case with Live Again, when I don’t realise it. The aim now is to put-out the new record, Stripped Back (well over a year later than I said I would) sometime early-to-mid 2017. The songs are recorded and they have been ready for release for a while. I just haven’t been ready to release it. I had to do the SING4SANE project and release the S4S version of Live Again first because that song is about me learning to ‘live again’. It felt important to me to work on that first before moving forward musically, or in in any other way.